I’m seriously hanging on to these last days of summer for dear life. That means I’ve been doing lots of barbecuing and having lots of outdoor picnics with friends. This is a perfect make ahead meal, that can be brought to a potluck, bbq, picnic or just eaten at your own leisure. It actually tastes better on day 2, once the potatoes have really absorbed the dressing and flavours. Serving bowl and serving tongs courtesy of Britannia Kitchen & Home. Line a baking sheet with aluminum foil or parchment paper, and place bacon strips side by side, in an even layer on top. Place in cold oven, and turn the oven on to 400F. The bacon should be finished and crispy in around 15-20 minutes depending on thickness. Once cooked, place the bacon strips on paper towel to absorb any extra grease. Reserve the bacon fat for later use. Fill a large pot with salted water, and add potatoes. Bring to a boil over high heat, and cook until potatoes are fork tender, around 10-12 minutes. While the potatoes cook, whisk together lemon juice, mayo, sugar, mustard, splash of bacon fat, dill and salt and pepper in a large serving bowl. As soon as the potatoes are done cooking, drain them and toss them in the dressing while still hot. This will help the potatoes soak up the dressing. It may seem as though there is too much dressing, but as the potato salad sits, more and more of the dressing gets absorbed. Cut the kernels of corn off of the cobs. Pour around 2 tsp. of reserved bacon fat into a large fry pan. Turn the heat to medium and add in the corn kernels, and season with salt and pepper. Cook the corn until the starchiness is gone, around 5 minutes, stirring often. Crumble the cooked bacon and add to the potatoes along with the cooked corn and green onions. 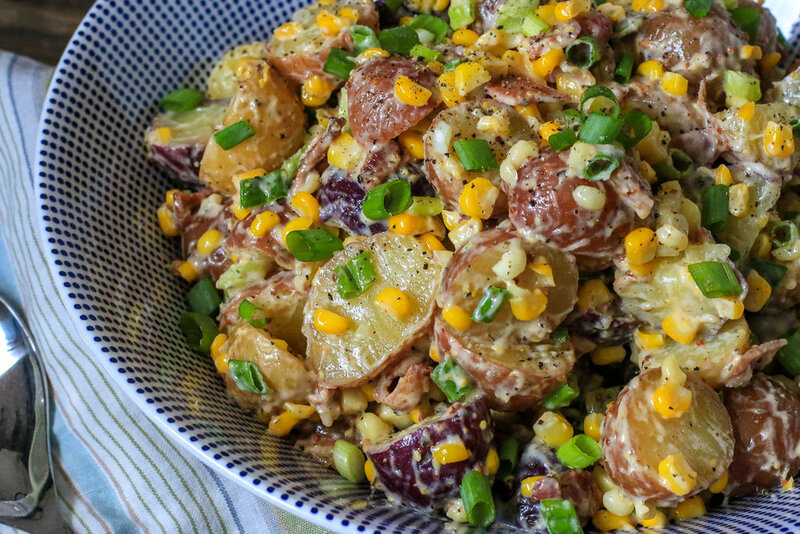 Toss the potato salad and refrigerate for minimum 3 hours before serving. Will last, covered in the fridge for up to 4 days.